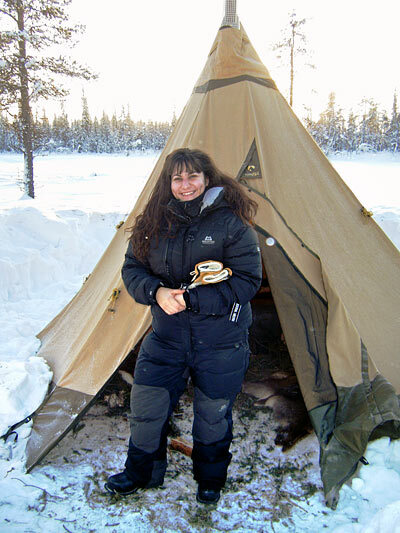 In early 2011, Thalia Georgiou took her first steps into the world of Bushcraft by joining Ray Mears and the Woodlore Team on our Arctic Experience Expedition. 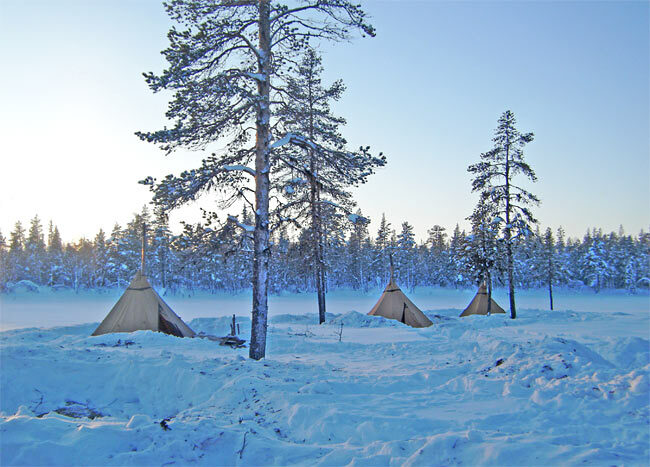 Her time spent in the wilderness of Northern Sweden helped Thalia to gain not only new skills, but a greater understanding of the isolated environments of the world and the peoples who call these places home. We were asked to introduce ourselves and explain why we had chosen to come on the course. It was a simple task but one that filled me with an immediate sense of unease. In truth I was not sure why I was there. 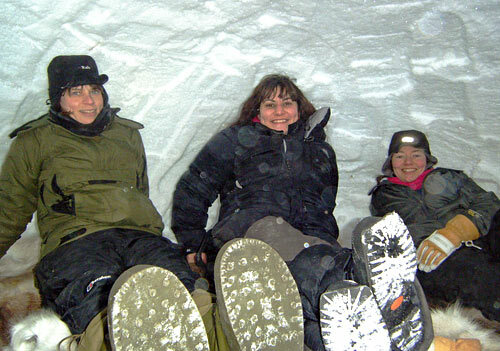 I had never had an interest in Bushcraft nor travelled anywhere cold. I had never been on skis or pitched a tent. The great outdoors, the north, even the Kit List were as unknown to me as anything could be. The city was my home. But for some months my mind had been increasingly distracted by thoughts of what lay beyond its reaches. The chaotic urban world which had long appealed to me now left me longing for something different and instinctively I knew there was something more out there that was tied to my own path in life. So, not being a person for half-measures, I decided the best way to explore this was to experience the world from an opposite extreme – somewhere remote, quiet, wild and utterly devoid of the things I knew. Despite the array of companies taking people into the wilderness, choosing where and how to go wasn’t easy. There were only a handful of people in the world that I could think of that seemed to understand the natural world on its own terms; the way I wanted to understand and be introduced to it. Ray Mears was one of those people, so when I found the Woodlore Arctic course I didn’t hesitate too much about signing up. 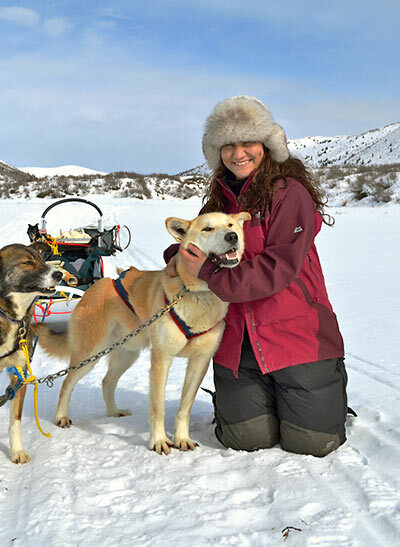 And so here I was, up in the Arctic, as curious as I was apprehensive about where my instinct – the truest guide I have ever had – was taking me. Over the coming days I was thrown into situations and environments that challenged me to think of the things around me very differently. This was not a place unwelcoming to visitors, but it did demand a certain attitude from its guests which took me time to cultivate. My first few days of mainly failed attempts to simply take and use what I wanted from the environment were only improved when I came to appreciate nature as something to be treated with respect and care. My sense of competitiveness, something which served me well in the city, found little place here. Instead patience, concentration and collaboration were the only ways progress was made in the north. I was easily the least experienced person on the course but the environment was pretty indiscriminate – it measured you not on the hours or weeks you had spent there but the way you approached it.Perhaps most surprisingly I realised how long it had been since I truly learned something new. Learning to learn again was a very difficult but humbling experience. Allowing myself the room to make errors whilst having enough persistence to carry on was not easy, especially when I was accustomed to a daily routine that required little thought. Asking for help – a sign of weakness in my city world – was also part of my learning and I was surprised at how helpful people were. Even upon waking the then-stranger next to me on the second night, to let her know I needed to ‘adapt’ our claustrophobia-inducing shelter and make it more airy (and consequently colder) was met with pragmatism and kindness. Ray, Dan and Lars were generous with their time and knowledge. They never refused my repeated requests to be shown how to do things again (and again, and again!) and waited with me at the top of even the most embarrassingly mini-hills until I felt ready to ski down them. They were as keen as I was to make sure I understood things. As my confidence and ability to cope with the cold grew, I would try to take walks a little further from camp on my own. These were my favourite times, when I could just listen and learn. I always knew the Arctic would be a demanding environment for me, but I soon realised the cold and dark spelt hard work for everything living there, no matter how well adapted. The hostile forest I had seen on my first evening slowly ebbed from my mind, replaced instead with a new understanding of it as a living, knowing and fragile place. My thoughts turned to the people for whom the vast boreal forest was home; the indigenous people of the north, the custodians that had nurtured this great place that I now enjoyed. And I felt deeply saddened to think of all that was going on in the world that threatened to disrupt their lives and the intricate balance they had preserved for centuries. I returned to London with mixed emotions; pleased to have been away but somewhat weighed down by the many questions I had returned with. My work, as an advisor and consultant to health organisations in the UK, was increasingly politicised with the reforms of a new government. I felt a growing distance between what I was doing and the impact it was having in improving the health of individuals and communities. My mind turned often to my experiences in the north, and I started reading about the communities spread across the circumpolar world. After a decade of working in health services, there are sadly few things that shock, but the health statistics, the social challenges and the disturbing treatment of indigenous northern peoples by colonial ‘modernisers’ were things I found deeply affecting. People often think working in healthcare must be depressing, but conversely it reminds you just how strong the human will to live is. Through illness, pain and all the hardships many people face, our desire to survive is ingrained deeply. Yet in the Canadian north, I learnt the rate of suicide for the Inuit was the highest in the world; staggeringly 11 times higher than the Canadian average. For me, of all the indicators measuring ‘the state’ of societies, suicide is the ultimate measure of a people in distress. And to find the suicide rates highest in the far north, where people had not just survived but had lived and thrived through some of the most gruelling physical conditions on our planet was shocking. I decided I needed to learn more about what was happening and contribute my skills, if I could, to support a better future for people we have taken so much from but given little to. After months of planning, I arrived in Canada in February 2012 – almost a year to the day I travelled to the Arctic with Woodlore. I am working with a truly incredible NGO called CESO-SACO to support various First Nation and Inuit communities with projects in self-government, health planning and management. In between assignments, I am hoping to travel a little and see more of this vast land and its people. I spent a month in Ontario with the Anishinaabe people, staying on reserve as well as in the city and witnessing the complexities of lives lived between two worlds. I am currently up in the Yukon where we are beginning to establish a programme with the First Nations Council on governance and health issues. Having opportunities to meet the various communities across Canada and hear their stories in their own words is really incomparable to anything I read in preparation for coming here. The women, in particular, have taken great care to welcome me into their world and help me understand their customs, their histories and their roles. I am often working in proud matriarchal cultures and I think they feel a responsibility, as older women and leaders of their families and societies, to guide me. Many are also fantastic storytellers, traditional healers and craftswomen, and I love listening to them, learning from them and watching them make beautiful items. One lady has just finished some beaded seal skin mukluks for me – the workmanship is astounding. I hope to be able to make my own for next winter but they are not as easy as they look to make! They tell me I am lucky to have come in the winter, a time traditionally for resting, sharing stories and being indoors (for the women anyway) and we meet often and talk – a universal female trait! We have no word in our languages for immigrant. We believe and have always believed that the land is for everyone – everyone can eat, hunt and live but that requires us to be responsible and only take what we each need. We have forgotten what we need. Only time will tell what can be achieved here in Canada’s great lands. I am not sure what the future holds for the communities that have so graciously welcomed me into their unique world. But as anyone who spends any real time here will know, if hope leaves these lands, and if we are unable to learn to manage the environments properly and work with the people for whom this has always been home, then the consequences are something we will all feel. Diversity is the greatest strength we have as a human race. Our cultures, our languages, our adaptations to our lands – it is because of these differences, not in spite of them, that we have grown and sustained our race. A week away with Woodlore will not teach you all the skills you will ever need to survive in the North – these are skills that could easily take a lifetime to learn – but you may just gain something more important: an insight into a world in need of understanding and for that, I can think of no better people to help you learn. 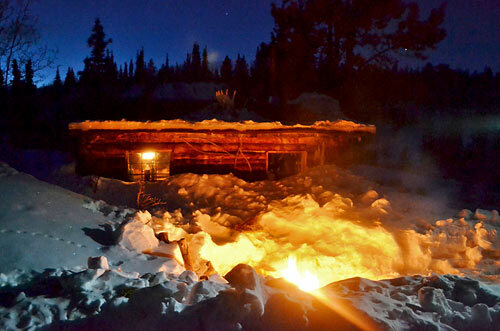 If Thalia’s story has inspired you, please take a look at Woodlore’s Arctic Experience Expedition for 2013. This entry was posted in Bushcraft Courses & Expeditions, Customer Posts on May 24, 2012 by Woodlore Team. Thank you for sharing your experience with such great craftsmanship – I found it thoroughly inspirational and thought provoking. I wish you the best of luck for your invaluable work in Canada. An amazing adventure! Really inspiring, thank you. Inspirational, and refreshingly well grounded in respect, and understanding, both of the environment and oneself. The First Nations’ gain is our health service’s loss, I feel!